The cover of Rainbow, 15th December 1917. 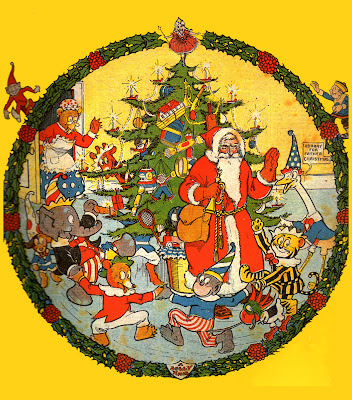 The downthetubes team would like to wish all our readers the very best of the season. If you're travelling, take care out there and enjoy some down time with family and friends. Normal service will be resumed here in the New Year... although we may just sneak a couple of posts up before then! Here are the latest issues of DC Thomson's Commando to fight their way through the snowdrifts to the newsagents’ shelves. Just in time for Christmas, too. If anyone is having difficulty getting copies in the seasonal weather, Commando editor Calum Laird suggest you email shop@dcthomson.co.uk, and the team there will do their best to help out. Plus, a subscription might be a wise investment as missed copies of our upcoming 50th year’s output may cause some wailing and gnashing of teeth! 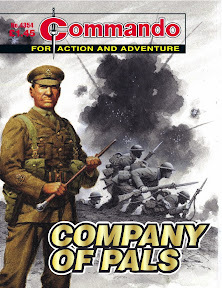 Commando fans may have noticed the official website (www.commandocomics.com) has had an update. 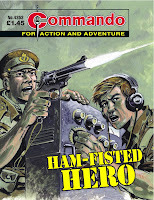 DC Thomson are trailing the launch of digital editions of Commando, launching next year, on the site, and there's now better links to an extensive guide to the title's back issues list and behind the scenes features. Barbed wire, watchtowers and searchlights — the camp looked like any other POW cage… from the outside. But hidden behind the perimeter fence was a nightmare world where starved prisoners were forced to act as guinea pigs for the sadistic doctors of death! 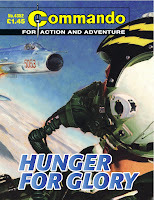 Colonel John Devlin, USAF, had chased glory in three wars…but it had always passed him by. Now, in the savage air battles over war-torn Vietnam, he saw his final chance to grab it when a new pilot arrived — a real hotshot, a born ace. There and then Devlin decided that this top gun was going to be his ticket to glory…regardless of the cost of men and machines! This is a re-issued story which reminds us of just what a talented artist the late Josè Maria Jorge was… especially when it came to aircraft. 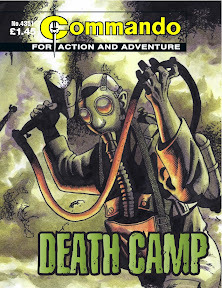 His very first Commando story will be appearing in late January 2011. Young Wally Clegg was a nice lad but a bit of a clumsy clot. As soon as he got near a ham radio set, however, there was a veritable transformation and he became a communications wizard. And although he was bounced out of the Royal Signals Corps, if there was radio work to be done, Wally was there to do it. Now the Japs were poised to invade India and it looked like only Wally could send the message that would stop them. With the pressure on would he be a wireless wonder or a Ham-Fisted Hero? They marched of to war together, the young men of the town. Proud to serve their country and happy to fighting alongside their mates. But the Western Front in the First World War was a place of nightmares and the town’s nightmare came true when the company of pals was wiped out. • You can read interviews with former Commando editor George Low, current editor Calum Laird on the downthetubes main site. 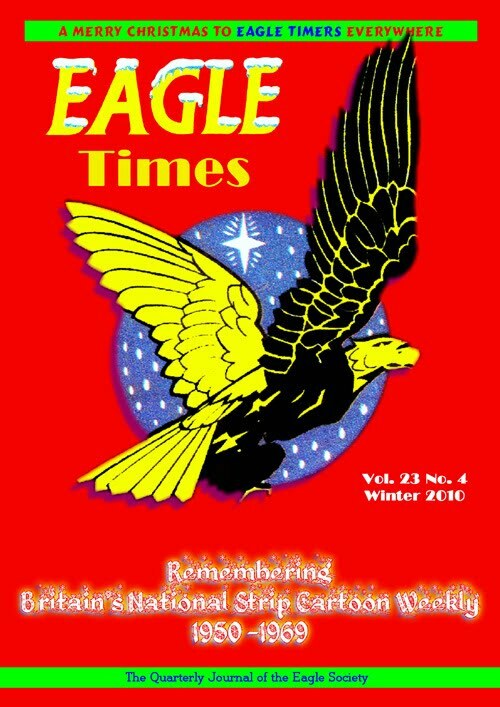 Eagle Times, Britain's longest running comics fanzine, is making sample issues available to purchase without the need to join the Eagle Society. While the magazine concentrates on the original 1950s and 1960s Eagle, the current issue includes features on the career of artist Brian Lewis, a detailed look at one of the new Eagle Dan Dare stories illustrated by Ian Kennedy and Carlos Cruz, the Swift strip Sammy In Space, and a selection of colour photos from the Seacon 1979 World Science Fiction Convention which was held in Brighton. Approximately half of all the current issue's pages are in colour. 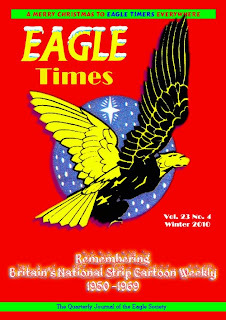 Begun in 1988, the 56 page A4 size Eagle Times is published 4 times a year by the Eagle Society but as it is a club fanzine it has not always been easy for non-members to find and purchase a single copy. The society is now offering non-members the chance to purchase a sample copy for £6 including UK postage or £8.50 for the rest of the world. This can be an available back issue or the next issue to be published. If the buyer takes the next issue to be published and then decides to join the society the cost of the sample issue can be deducted from the annual membership. There are more details of the offer of the Eagle Times blog. Details of the contents of the current issue, Volume 23 Number 4, are here.